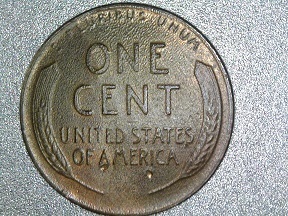 Damaged 1956 D Test Lincoln Wheat Cent Or Just Junk ? 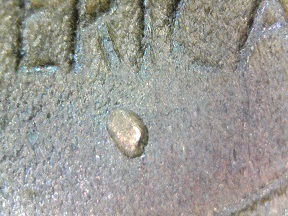 Loos more like the coin was damaged. 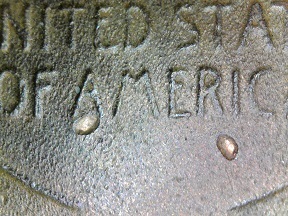 It looks like it was also treated in acid as well. So I'm thinking it is a PSD issue. 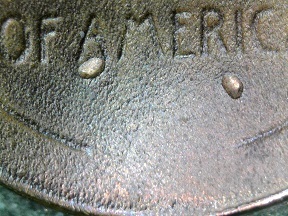 Spelt it wrong Its Rockwell test mark There is a 1971 I think showing a mark looking like the ones on this coin. 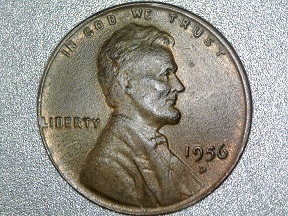 @DE, Rockwell hardness testing as in the coin in this link from error-ref.com: http://goccf.com/t/345077. 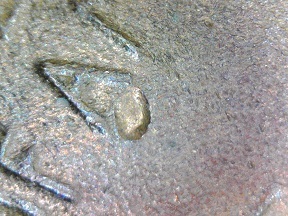 The dimples on your coin don't have completely smooth sides though so I suspect that they occurred after this coin left the mint. Agree PMD, maybe some acid at work as well? Probably dipped in acid by the looks of it. 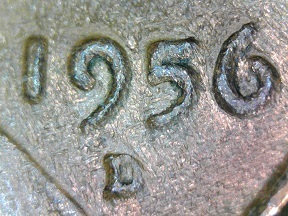 levelsofmadness: just posted a 2019 Quarter asking the same as me about the test mark.>>>Funny his mark on a 2019 looks the SAME as the ones on my 1956 coin HUMMMMMMMM..ODD thats a lot of years apart to show up with the same mark.